Today's question comes from San Francisco. 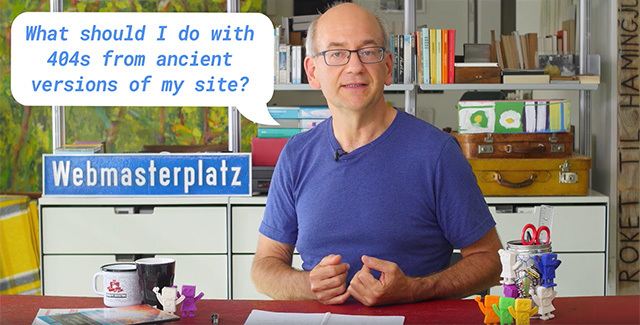 What should I do with 404s in Search Console that are from ancient versions of my site? So sites evolve over time, URLs change, you add redirects, redirects get dropped over the years, sometimes URLs are just no longer needed. These URLs end up returning 404. So they show up in Search Console as crawl errors. But what does that mean? When an invalid URL is opened it's the right thing for a server to return a 404 page not found error. When doing a restructuring of your website, we recommend redirecting from old URLs to the new ones and updating the links that go to the old URLs to point to the new ones directly. However over time you might decide to drop those redirects. Maybe because of the maintenance overhead or just maybe you forgot about them. These URLs are now 404 is in Search Console. In your server logs or analytics check for traffic to those URLs, if there's no traffic that's great. In Search Console, check for links to those URLs, are there no relevant links? That's great too. If you see nothing special in either the links or the traffic, having those pages returned 404 it's perfectly fine. If you do see traffic to those URLs or see links pointing at those URLs, check where they're coming from and have those links point out the new URLs instead. Or if it looks like a lot of traffic or links are going to those URLs, perhaps putting a redirect back in place would be more efficient. That works for a few crawlers but what if you have a ton of 404 errors? Search Console makes this easy, it prioritizes crawl errors for you, if the top errors in the report are all irrelevant, you can rest assured that there's nothing more important further down on the list. Crawl errors for 404s that you don't want to have indexed, don't negatively affect the rest of your site in search. So take your time to find a good approach that works for you. In short, 404s are normal and if you intentionally 404 a page that you no longer have and have no matching new page URL then 404 makes sense. If you are losing traffic or links, you may want to point the links from the old URL to a new one, depending on relevance. Watch the video above for a quick overview.